Lincoln City’s Thumbs Up To Health programme is home of the incredibly popular walking football. The sport for the over 50s has kept growing over the past year and has been highly successful in keeping the elder generation fit and healthy. When the programme started out in Lincoln, only two or three people went to the session each week but the numbers kept rising. The sessions are funded by the Football Conference Trust and Cargill to allow the over 50s to come to the sessions for free. The popularity of this programme has caused an expansion over the county. Three weeks ago, walking football was introduced in Birchwood. However, this was aimed at a different group of people. The target group were aged between 40 and 70 and set up outside of Age UK to get more people involved who don’t think they are old enough. “The only thing really is that it’s walking football so they’ve just got to walk. In Birchwood they tend to power walk a lot more, whereas here a lot of them suffer from medical conditions so we have to be quite restrictive. “Everything else is exactly the same and hopefully the team bonding and the friendship will be the same as you get from any football team,” said Lincoln City’s Health and Lifestyle Co-ordinator, Lauren Flint. 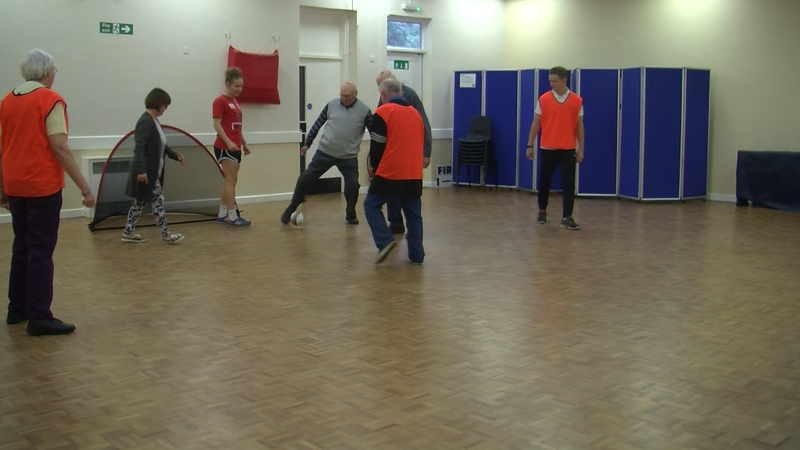 They have also set up a gym session for over 55s at Sincil Bank and many other activities to get people involved. “I came for the social aspect mainly. I play table tennis on the Wii, carpet bowls, new age curling, football today and bowling this afternoon. All in this building,” said Ron Gibbon. In the future, they hope the programme will expand into Grimsby and Boston.